I had not planned to write and post this ride as I had several post already riding with this group of riders but something happened that made me think perhaps I would. All the riders met at the usual location just before the 10am start time. 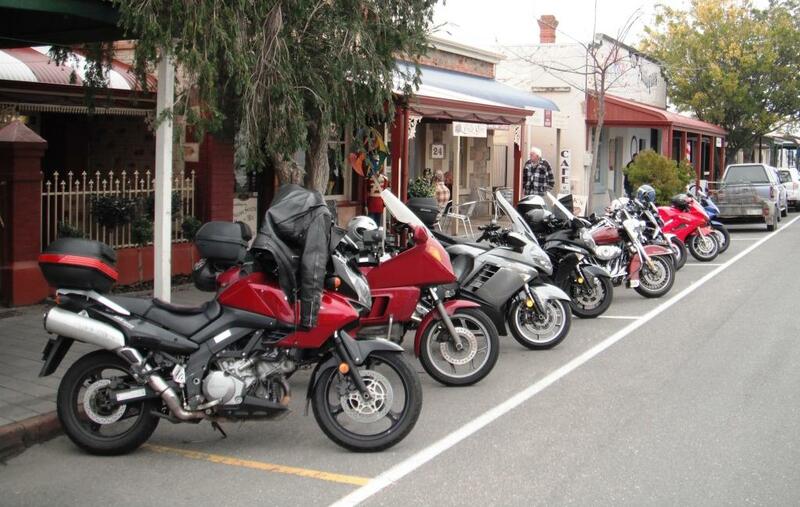 They had decided to ride to Strathalbyn for morning tea. About a 35 minute ride north if you take the high road as we do. The high road is more suited to bikes and there is a lot less traffic. I was not really expecting the leaders (and the followers in front of me) power through the corners quite as quickly as they did and I found myself doing catch-up. It’s not that they were speeding it was just they were making full use of their tyres. I guess they have ridden these roads for 40 years (or more in some cases) so were not real interested in the sights like me. We arrived in Strathalbyn and I promptly lost the riders in front. Traffic held me up at an intersection and by the time I got to the next one they were out of sight. (Slippery Old Farts). There was another one of the group behind me and he was unsure where they were going. We rode around for a few minute and soon located them with their bikes parked up and already inside ordering their drinks. We ordered our coffee and something to eat. I had a small Apple Danish, very nice. The coffee was good also. It was just as well a bus load of tourists hadn’t arrived as the staff were a little confused with our orders 🙂 . I walked outside to get the above Photo and a couple of others and then walked back inside. I tell ya this lot are a noisy lot. they were obviously enjoying a good old chin wag. The decision was made to go to Murray Bridge community club for lunch so we left town together. We passed a couple of slow trucks and we just made it through Callington and turned left onto and soon passed another truck a as I rounded the next bend I felt the back end of my bike start to drift wide. This got my attention very quickly! Mmm I think I may have a flat. I pulled up on the road verge and had a look at the rear tyre and after a quick inspection thought it not deflated that much so would try to limp into Murray Bridge to the local bike shop for repairs. A couple of the riders had stopped to offer assistance and then followed as I rode towards town at about 70km/h. It was soon evident that the tyre had lost all it pressure and so I pulled up. I placed the bike on its centre stand and inspected it for any protruding object. I inspect around it twice and could find nothing. 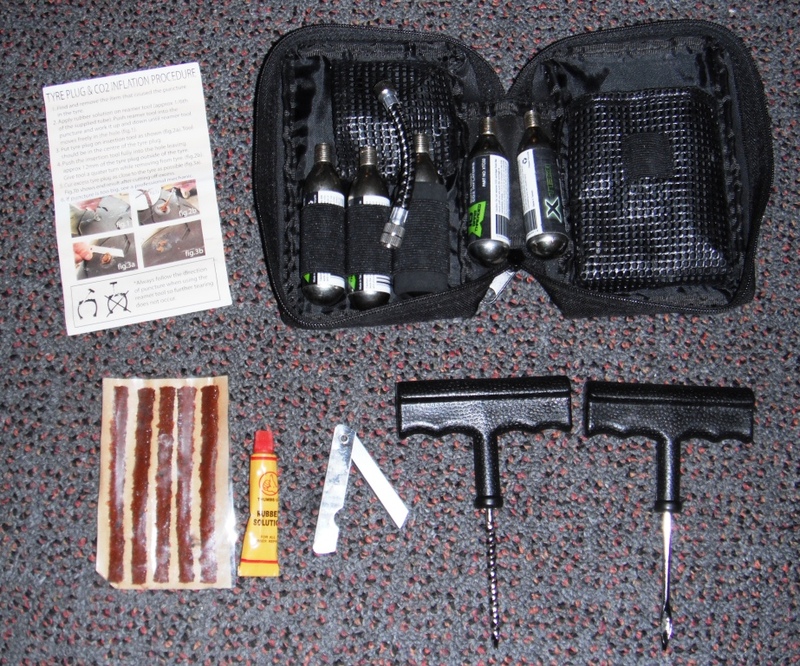 About 4 – 5 years ago I purchased a tyre repair kit which has 5 small cylinders of pressurised CO2. You know I bought this kit and never bothered to read the instructions or even inspect its contents. After opening it up and wasting the first cylinder to the atmosphere I worked out how to do it correctly. I used a further 2 cylinder to inflate the tyre. I was surprised how quickly the little cylinders and attachment were covered by dry ice. So a word of warning to anyone using these, They freeze the surfaces of everything the gas passes by, INCLUDING YOUR FINGERS. The kit comes with a foam insulating cover for the cylinders, worth using. With enough air in the rear tyre I managed to limp into Murray Bridge and park up outside the motorcycle shop. The other 2 riders who followed me in to in had parked behind me and I thanked them and said I would get the necessary repair done and would catch them up at the club later for lunch. 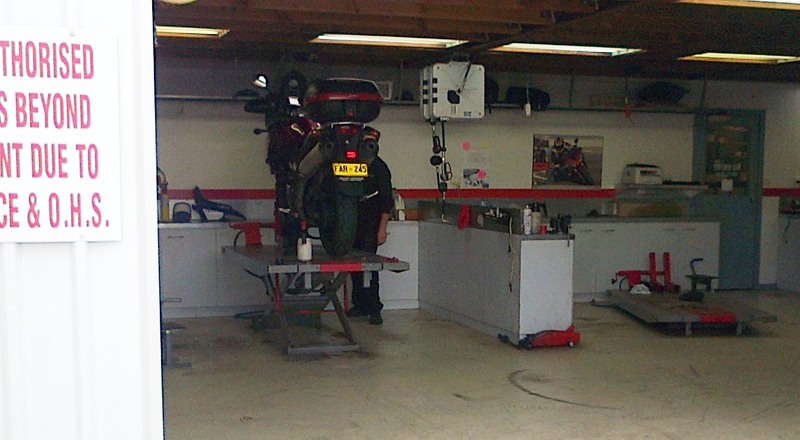 The mechanics wheeled my bike into the workshop and started their inspection. Seems insurance liability and OH&S reg’s make entering a workshop a no go zone for non employees. Disappointing how people cannot take responsibility for their own actions. But I won’t start to rant about my thought on that. The first chap could not find an issue with either the tyre or valve after inflation. I then informed them that I had re-inflated it just 10 minutes prior to arriving at the workshop and by the time I got there it had lost its pressure Again. Then both Mechanics inspected the tyre and valve. No issues found. They replaced the Valve in hope that this may have been the problem. I informed them that I would be in town for an hour or so and if the tyre was a problem before I left, then I would be back. While I was there I purchased 3 new cylinders of CO2. $4.95 ea. A cheap investment I think. The salesman from inside the shop had brought them out and I was to pay for both the cylinders and labour in the service area. Upon asking for the bill he said $14.85 thanks. ???? What about the labour and the Valve? That’s okay sir I just hope the remainder of your days ride is good with no tyre issues. I could not give these chaps a better wrap. They must have spent a good half hour trying to find the problem. Thanks “Riverland Motorcycles” and the boys at their workshop. 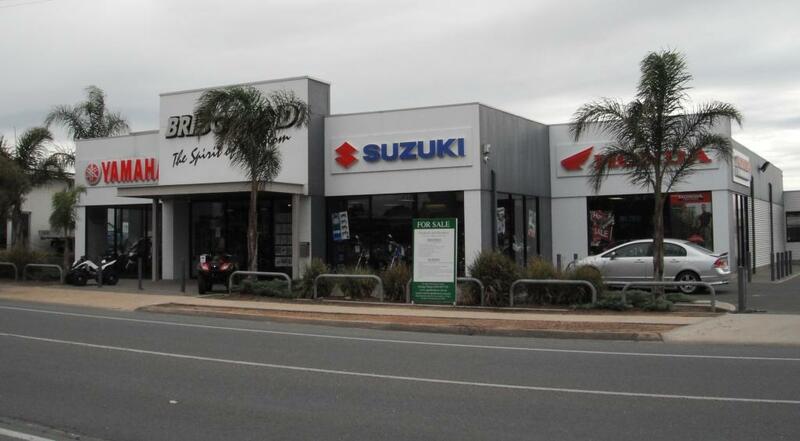 “Riverland Motorcycles” located on the main road traveling into Murray Bridge from the Western end of the Freeway. I joined my fellow riders at the Murray Bridge Community Club and ordered my meal. One of the topic’s over lunch was my repair kit. I was surprised that many of them did not carry one with them, but then I didn’t for 30 years. We left the club after lunch and home to Goolwa via Langhorne Creek and Milang. 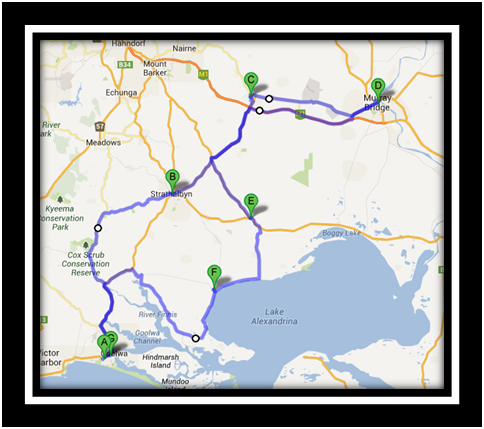 We where very lucky with the weather and only seen one small shower on the last stretch to Goolwa. My tyre gave me no further grief for the trip back. After getting back to Goolwa we went to the Ballast Stone Cafe for a coffee. I took my tyre repair kit in and handed it around the table for the other riders to look at with a couple of them saying that they should buy one. I cannot remember the cost but I think it was about $40.00. As I said earlier it is a good investment and while I had not used mine since I purchased it years ago it has sat in my topbox until needed. If you do not have a repair kit, then I recommend that you purchase one. If you don’t use it, ever, it is still worth the peace of mind knowing you can get yourself out of trouble. Oh and it is a good idea to read the instructions 🙂 . Even waste a bottle or 2 of the CO2 gas at your home so you are practiced in its use. I would also like to say that these kits are good to get you out of trouble but it should be considered a temporary repair until you can get your bike to a professional repair service and have the repair done correctly or if necessary replace the tyre. Your life depends on them. So very true about carrying a repair kit, especially with only two wheels. We found outprselves in a situation where we needed to replace a tire after repairing it temporarily, and being in a remote place we were fortunate to find a small garage. They even allowed us to use one of their bays to do the work ourselves. however, we had to have a new tire couriered to us which took two days….the gist of this story is we got to spend some time in a small community which still stays in my memory as one of the best times! And…..the owner of the garage did not charge us! He said, just do something nice for someone else when the opportunity presents itself! And it did! So grateful.